Up past Middleton and towards Carsington Water, “First sight of Godfrey Hole“ in the greenery of the southern peaks of the Derbyshire Dales. Here the scenery is one of green fields and low hills and deep valleys beautiful but not as rugged as the Dales further north. The Zantium Studio is in a substantial stone build house which is accompanied by three cottages a perfect place to spend some time relaxing and learning something new. The view from the back of the house runs all the way to Carsington Water. By lunchtime Barbara has done the first talk and we are all hard at it! Yes, and laughing. 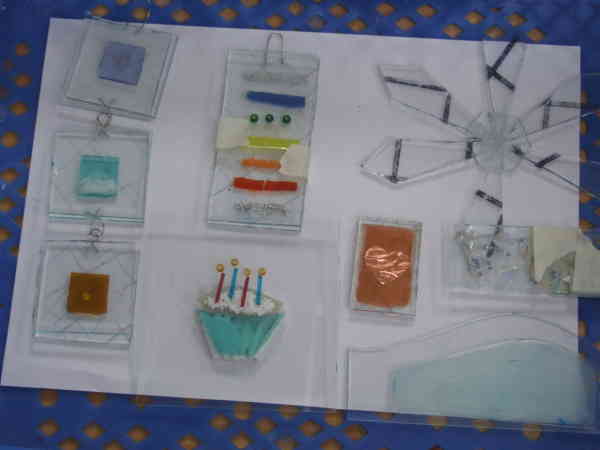 We have learnt something of the materials we will be using and the techniques we will be using and we have handled the glass cutter. This tool is either your best friend or your worst enemy, a well made cut and the crack flows down the grove to the end no matter the shape. A bad cut and ping the crack goes off along the weakest route through the glass almost always not where you want it to go. Yes I did say crack twice in the previous paragraph because what you are doing is making a controlled break in the glass. Or at least that is the theory, it’s not hard but I can assure you it is not easy and sometimes you look at the result thinking; how did that happen, how can I use this! My bits at the end of day two, awaiting firing. The two rounded pieces are a glass plate slumped into a former and a dish slumped around an ovaloid former. 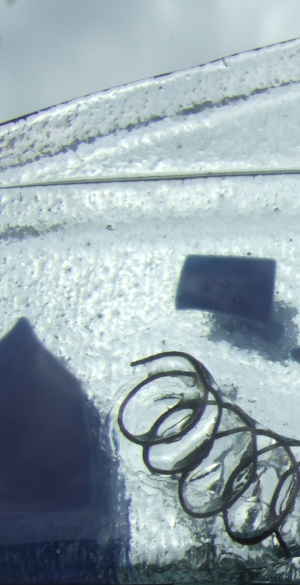 The plate has Ivy leaves and copper wire between the layers of glass and the dish has pieces of glass on the outside which will fuse to the surface before the glass slumps over the former. 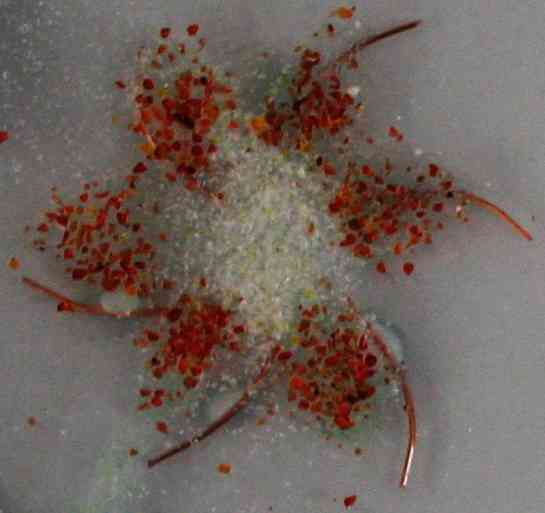 To see the finished articles go read the page about my work. 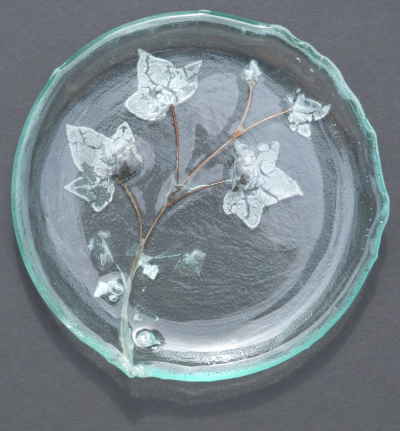 The daffodil wall or window hanging is in the middle and this is a simple glass sandwich with glass flakes and copper wire embedded between the layers. 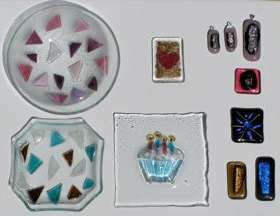 There is also some unfired dichroic jewellery just to the left of the daffodil, the fusing process changes these piles of glass bits into something wonderful. 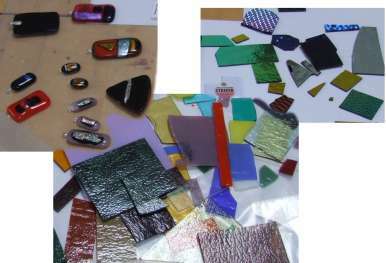 This little montage shows bits of Bullseye and Dichroic Glass and a few piece of jewellery made for the material. The transformation that takes place during firing is almost magical, get the colour combination right and the dichroic glass transforms an interesting piece into something wonderful. Barbara hates having her picture taken and her face shows it. But if you are crafty and don‘t let her know she can be caught smiling and enjoying herself. It‘s just a shame that I spoilt the best picture by shaking the camera when she was looking straight at me. Seriously, this is how we spent most of the weekend smiling laughing and having great fun. 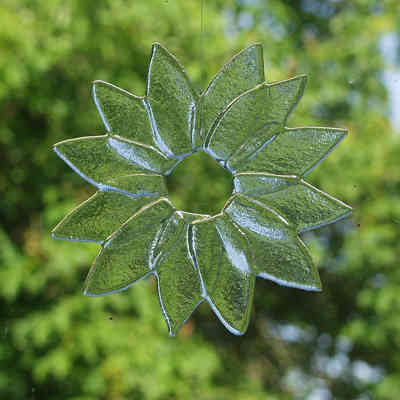 Barbara makes wonderful things with recycled, glass character and good for the environment. I am not going to say much the pictures tell the story. She also makes these beautiful buttons. Some detail of more of her work. 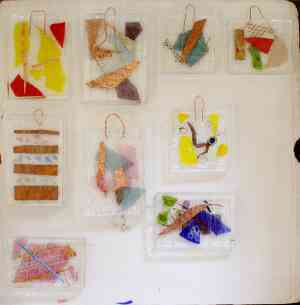 Go to Barbara Coulam: Clerestory Glass for more information or to Zantium Studio for information about courses. First let me say these pieces represent my first attempt at Kiln Formed Glass. 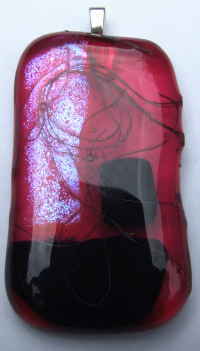 The techniques use can be described as fusing and slumping. 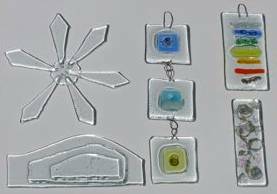 Fusing is where pieces of glass is stuck together by melting, the hotter the kiln the more they melt and the more they run. Slumping is where the glass is placed over or in some kind of former and is allowed to slum into or over it. 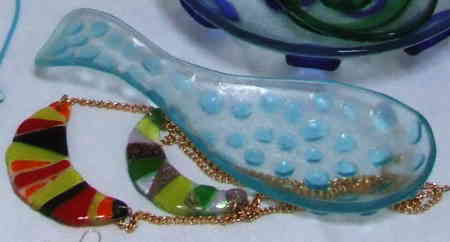 The two techniques can be combined and generally even the simplest slumped piece involved fusing if more than one piece of glass is used. The photograph above right is of the complete pendant and it is my favourite piece. One other factor I didn’t mention is that the this particular glass changes colour as it is fused and that added yet another unknown to the process. In the end it just works so well I love it! The daffodil to the left is a window hanging and is made from two layers of clear glass with copper wire and coloured glass flakes trapped between. The style is intentionally very primitive in this medium less is defiantly more, the fussier you get the more likely you are to have a disaster. It looks wonderful when the sun shines through it but I think it would have been better if the wire was thinner as it is just a little too heavy. The photograph to the right is of a small part of a mirror surround which works incredibly well but add mirror to glass and for me at least it is impossible to get a good picture so sorry only some detail but what detail. The flakes of opaque dark blue glass appear to float above a textured surface, the glass is in multiple thicknesses and coil of copper wire has again trapped many small bubbles the eye does not know where to settle, wonderful. 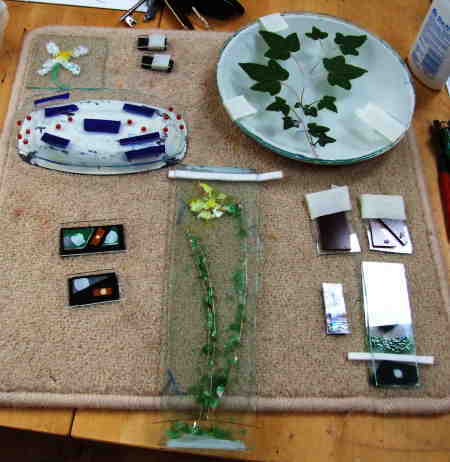 Finally, the plate below is made from two layers of glass trapping Ivy leaves and some copper wire. Again this is a somewhat random process the leaves oxidise and leave a shadow. However, it does not always work that way, the dark patches are where some air has been trapped with the leaf and the organic material has converted into carbon on the inside of the bubble. I don’t care this is my favourite piece it’s thick and chunky with uneven bits and bubbles but it sparkles and casts shadows that are wonderful and full of interest. If I have raised your interest in any way and you are interested in learning more please feel free to contact Zantium Studio or Barbara Coulam of Clerestory Glass and enjoy yourself. I do hope you get as much fun out of glass as I have so far. One cold damp Sunday morning I headed for Draycot, just south of Derby, to go to The Beetroot Tree. 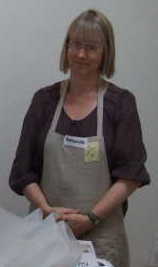 This is the second time I have taken part in a warm glass course. 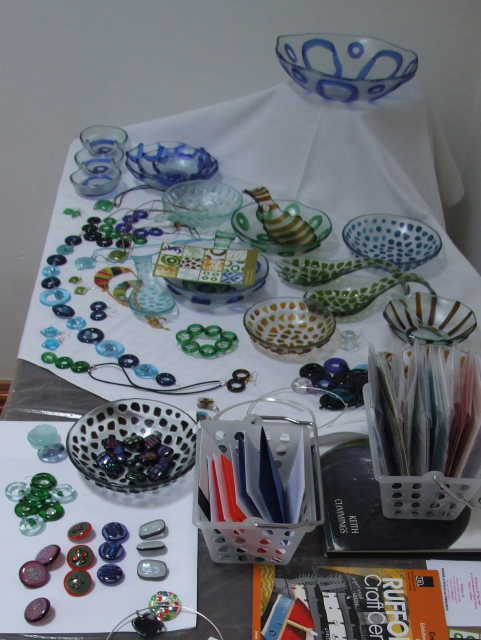 I have to admit a bias I love glass in all it's forms but I must admit fused glass most of all. 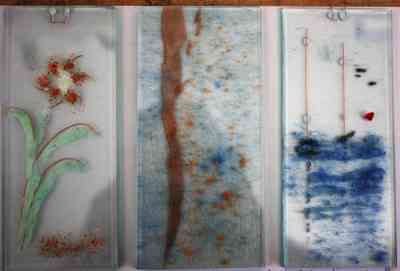 They say watercolours are the pinnacle of painting, well I think fused glass is the ultimate form of glass art. Glass is a very slow moving liquid that sticks to itself once it is heated to the right temperature. Heat it a little more and it starts to move, to slump and eventually it will flow very slowly. Therefor by picking your temperature you can make it do almost anything, but it's not easy, every kiln and every batch of glass is slightly different and it all takes time, a lot of time. One cup of coffee and we are all up to our elbows in Bullseye Glass in little over an hour we had all made our first piece and placed it in the bottom of the kiln for firing. An hour later and they are fused but glowing red hot. Small pieces of glass will take being heated up quickly but when it comes to cooling even small pieces need to be cooled with care. So it takes nearly three hours to cool them to a temperature where we can handle what we have made. Look closely at the pictures and you will see that the colours have shifted slightly. In nearly all case the colours have become slightly more intense. However, the metal foils are all copper and they have all gone much darker, many with a very distinct purple tinge. Once the Bullseye is in the kiln Stevie talks us through cutting glass, a bit of an art in it's own write and I illustrate how not to do it; generate a number of sharp shards and a ragged edge. Cleaver! However, once I learnt to follow instruction and forget what I had previously learnt it was much easier and then the call for lunch comes. Providing lunch for a group of people you don't know can be a bit of nightmare; do you provide a vegetarian meal because everybody can eat it or sort out the individuals as they come. The Beetroot tree decided to provide a vegetarian meal and it was very nice. 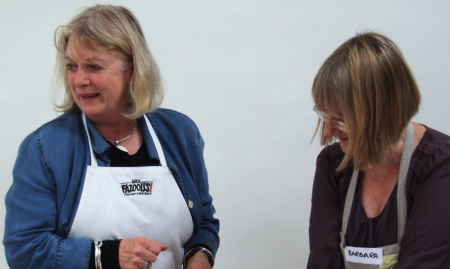 The highlights for me were the starter, a lovely warming vegetable soup and the pudding summer berries and ice cream. The main was a perfectly acceptable vegetarian lasagna, it was just a little bland and watery. Overall an eight out of ten not bad. After lunch the main event started and the time just went, three hours latter and we all had three plaques for Stevie to take home and to fuse in her main kiln. Me efforts left in with mixed feelings the one I sent most time on worked OK but in the end the colours were just to subtle and were therefore lost once held up to the light. However, the basic idea is sound and I will try that again. The second piece was a simple scene with two sailing boats at anchor with a red setting sun in the background. It was depicted in an abstract way without any detail, as strong lines and simple shapes. Again it nearly works but not quite and again partly because some of the colours are not strong enough. The pictures tell a thousand words, sadly the third one was just a failure it's meant to depict the Californian coast with the salt spray and the wind but Na! - just a failure! As ever I'm afraid the pictures don't do the glass justice and a hand held camera, no matter how good, in a studio lit for normal use does not help. So sorry for the poor pictures. I'm still working on this so come back and look again! 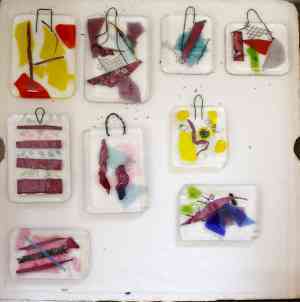 Sadly The Beetroot Tree has long since closed but Stevie is still making fused glass. I have progressed from the early random search for something I like to a position where I am now happy to lead small groups through a couple of hours of exploration. The glass as always seems to lead different people in different directions but always with a love of the colours and the textures. For this reason it seems that people with an artistic bent enjoy glass more than those who simply like following a pattern. 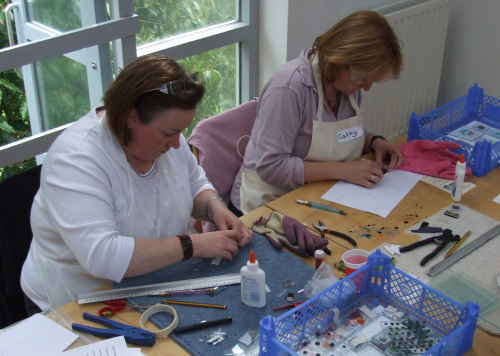 Dichroic Glass has a habit of grabbing people by the throat and dragging them in, particularly to jewellery and this makes a very easy entry to fused and slumped glass. I have to admit it got me too, but once the pieces start to get a bit bigger the amount or type of Dichroic has to be controlled or the impact is lost. Even with jewellery less is often more, in that a small flash of Dichroic Colour against a slab of a base colour is very eye catching without being over the top. Recycled glass has an appeal because you can work it with the only cost being the recovery of the glass and the firing cycle. From bottle slumping to bowls made from circles cut from bottles. The main problem is ensuring the glass is compatible, even two beer bottle may not work together and the glass shatter once cooled. It's all to do with the differential expansion and contraction that occurs in differing materials. Having said that because most bottle glass is very similar it's not normally a problem with bottle of the same colour but beware if you mix colours. First I have built a Graphical Glass Kiln Calculator it is based on the fusing cycles programmed into my KilnCare Hobby Fuser. However, I suspect it will work for all Glass Kilns and probably Potery Kilns as well. There are ten lines with one program on each and all the fields can be modified. If you change a field in the line that is highlighted it will immediately be reflected into the graph above. To save the data locally simply click on the “Save Table” button, this will put the data into a Cookie on you computer which will stay active for thirty days. If you don't want a cookie don't press the button. To change the line on display simply change to selection in the Display Row dropdown at the bottom of the page. Clearly as the lines on the graph are all straight the output is an approximation. To achieve any improvement in accuracy I would need to characterise the particular kiln, know the glass load and the environment in which the kiln was located. However, I think it is helpful as it gives an indication of the cycle time and the stage at any particular time. The difficult parts of the cycle are the full power heating and the uncontrolled cooling periods were the kiln is effectively out of control. So any place where the graph table has FULL or END the line is likely to be non-linear and to some extent unpredictable. In particular the cooling can take a lot longer than you expect. I am currently experimenting with various forms of recycled glass, trying to find a way to make old beer bottles into something useful. People seem to like the bigger ones as spoon rests in the kitchen but that is rather old hat and lots of people are doing that. So the hunt goes on! These pages are still under development.